Today I woke up to the awesome news that two episodes of Star Wars: Rebels season 2 were available on demand via the SkyGo app in the UK. It’s very surprising to find them out a month early here in the UK, as normally we don’t have access to the show until a few weeks after its U.S. air date! Interestingly the two episodes available–“The Lost Commanders” and “Relics of the Old Repbulic” are listed as episodes 18 and 19, respectively, of season 2. I believe this is a listing error as I’m certain these are the first two episodes of season two following “The Siege of Lothal,” which has already aired on television. Star Wars Rebels “The Lost Commanders” is the first of a two-part arc. The Rebel fleet including the Ghost crew are out in space, deciding on a new place to set up a base since the Empire dealt a crippling blow to their fleet in “The Siege of Lothal”. Commander Ahsoka Tano notifies the crew that she has an old friend somewhere out in the Silo System. Ahsoka mentions that this friend has a vast knowledge of the Outer Rim territories and could be of great assistance in finding a place for the Rebel fleet to set up a new secret base. Ahsoka mentions that she has sent numerous transmissions out to her old friend with no response; however, she proceeds by giving the Ghost crew the head of an old separatist tactical droid which will help them track down this old lost military commander from The Clone Wars era. The Ghost crew leave the fleet, and head out to the Silo System. When the band reaches Silo, the Ghost has a few technical issues. Hera decides to stay on board with Chopper to get them fixed, and in the meantime Kanan and the rest of the crew heads to the surface of the planet in search of Ahsoka’s old friend. Using the old tactical droid they begin to scan the planet. The tactical droid begins repeating a number “7567” to the crew. The gang comes across a Republic AT-TE walker that has been modified into a walking home with customized weaponry. 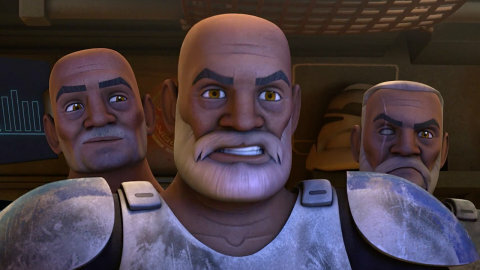 When the group reaches the walker they discover three men on board, consisting of old friends from The Clone Wars. Commander Wolffe, Captian Gregor, and of course Captain Rex live! Kanan is instantly on the defensive and highly suspicious. Kanan understandably has issues with these men as they are part of the army that killed his master, his order, and his way of life as a young man. With the two groups now together the Ghost crew reveals why they’ve sought them out. Ezra is instantly attached to Rex which creates a great dynamic on-screen and bridges two Star Wars television shows seamlessly. Another interesting friendship occurs when the slightly off-kilter Gregor uses Zeb as bait to catch one of the great beasts that lies under the planet’s surface. This reminded me off something not too dissimilar to “space-fishing,” if you will. They catch this humongous monster, and the whole Ghost crew participates in this sequence and its great fun as we see how the old guys have been living for some time out here in the wilderness. Kanan’s dislike for the clones is prominent throughout; however there is also another character who doesn’t appear to trust the Ghost crew, Commander Wolffe. Wolffe gives up the Ghost crew by sending a transmission to the Empire that a Jedi is with them, and this transmission is received by none other than my favourite imperial, Agent Kallus. Kallus sends an Imperial probe out to investigate, when the probe is finally discovered by Sabine, so is the traitor. Rex is extremely unhappy with Wolffe and asks him to explain himself. Wolffe proceeds to explain that he is afraid the Empire will find them out and kill them for helping the Jedi once again. However he goes onto apologize after he admits his cowardice and that being with the Jedi is the right side to be on. The screenshot from above is actually the clones talking to Agent Kallus over a transmission. Kallus wants to meet with them after the probe reported back (before being destroyed by Rex) that the Rebels ship (the Phantom) was with them. This is a brilliant sequence in which the Rex jokes about how inadequate the stormtroopers are and Kallus replies by telling him they are loyal soldiers in endless supply. It was great to see Rex back with his old personality. With Wolffe, Rex, and Gregor trying to make things right and Kanan still not trusting them (with reason now), the stakes are raised. We’re left wondering whether these characters in particular could ever become allies due to the scars left by Order 66 and the aftermath of The Clone Wars. Rex actually comes across as a very diplomatic and caring man. We see that the journey he has been on is significant and he’s come a long way since we saw him last in The Clone Wars as a character that follows orders at all cost. There are also some interesting parts in this episode where it appears even though these three Clones removed their inhibitor chips, they still worked for the Empire until being drafted out of service. This is an interesting implication indeed, and makes me wonder whether Rex continued service in the 501st under Darth Vader? An interesting notion for sure, and I hope as we learn more about all of these characters going forward as there are still mysteries to be solved about what exactly happened with these guys. As for the Ghost crew, I’ve made my feelings clear before that I am not a fan of Ezra or Sabine and that their characters do not resonate with me very strongly. This singular episode of season 2 has helped me reevaluate my feelings from Season 1 somewhat. All of these characters are undergoing changes right before our eyes and in this episode alone you see Ezra grow, you see his compassion for Rex, and in turn our compassion grows for his character’s arc in a substantial way. I’m looking forward to following Ezra in season 2, not only to learn the truth about his past, but to find a love for his character I’ve been struggling to find. Season 2 of Star Wars Rebels is looking really great and so far is topping the first season already!